You know you’re not going to use that $US25 gift card your grandma gave you, but leaving it in your wallet is a waste of money. In fact, it’s a huge waste of money: Unused American gift cards from the past six years have added up to $US44 billion of unspent cash. Lucky for you, there are websites that allow you to sell unwanted gift cards for up to 97% of their value, or trade them for ones you’d prefer. Those same sites turn around and sell gift cards at a discounted price, so you can get a bargain for credit to places you actually shop. It’s not just store cards that are up for grabs. These sites will also accept cards from retail restaurants and movie theatres. Which sites exactly are we talking about? Start with the three below, or use GiftCardGranny.com to compare prices among sites and figure out which will provide the best deal. Good for: If you just want cash for your gift card. How it works: You send your gift card in and pay for your own shipping. Giftcard Zen sends you a check once they have received the gift card. Note: You have to have at least one credit card and a cell phone that receives texts to sell a gift card. Good for: If you want to trade your gift card for another, or if you just want cash. How it works: You can either enter your gift card codes online, or send your card in (and pay for shipping). You can then choose if you want CardCash to mail you a check, provide you with a PayPal payment, a direct deposit, or an Amazon.com gift card. 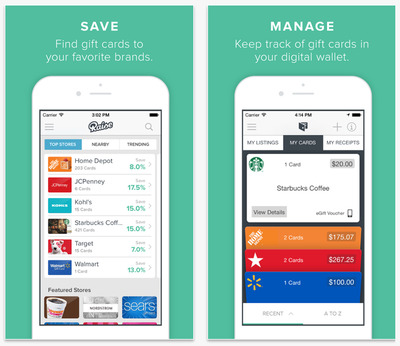 Good for: Selling your card from your phone. How it works: Raise provides you with a prepaid shipping label to send your card in, or you can enter the codes online. You can then choose if you want Raise to mail you a check, provide you with a PayPal payment, a direct deposit, or an Amazon.com gift card. Raise breaks down its fees clearly: A 15% commission plus $US1 or 1% fee deducted from your selling price if you send in your physical card — whichever is higher. Verdict: It doesn’t really matter which site you pick. We tested each of the sites to see which one gave the best selling price offer for a hypothetical $US50 Barnes & Noble gift card. Giftcard Zen offered $US37 and CardCash also offered $US37, or an Amazon.com gift card for $US38.48. Raise doesn’t allow hypothetical cards (you need an actual gift card code to enter and we couldn’t scrounge one up), but since the site lets users determine their own selling price, you’d need to sell your card for $US45 in order to get the same amount of cash as the other sites. After the 15% and $US1 deduction (assuming you sent your card in), you would be getting $US37.25 for your gift card. The biggest variance among the sites we compared is less than $US2, so no one stands out among the rest. Go ahead and choose by the interface you like best or the one that first comes to mind, but remember: We only compared the one card. If you take a moment to run your own numbers through multiple sites (or GiftCardGranny), you may find a frontrunner.